LSTD may sound like a new variant of a well known hallucinogenic, but the truth is much more exciting. Love Saves the Day is a two-day party taking place this weekend just up the M5 in Bristol. The festival began life as a one-day revelry managed by the creative team behind Glastonbury’s much-loved Wow! Stage and Bristol’s popular In:Motion nights. But one day just wasn’t enough. Too much fun was to be had. So the management did the only sensible thing and added an extra day to the festivities. Since then, the weekend has blossomed into one of the most eagerly anticipated events on the music calendar, frequently kick-starting the summer season with a trademark mix of eclectic live acts and general good will. In fact, it’s proved so popular that the location has moved out to Castle Park to accommodate a burgeoning crowd and reputation. And, of course, the timing couldn’t be any better, with the annual event providing a colourful tonic for those post-exam blues. Now in its fourth iteration, this year’s line-up boasts a typically assorted blend of hip-hop, grime, garage, house, techno and jungle guaranteed to get both the festival virgin and hipster blogger boogying all day long. 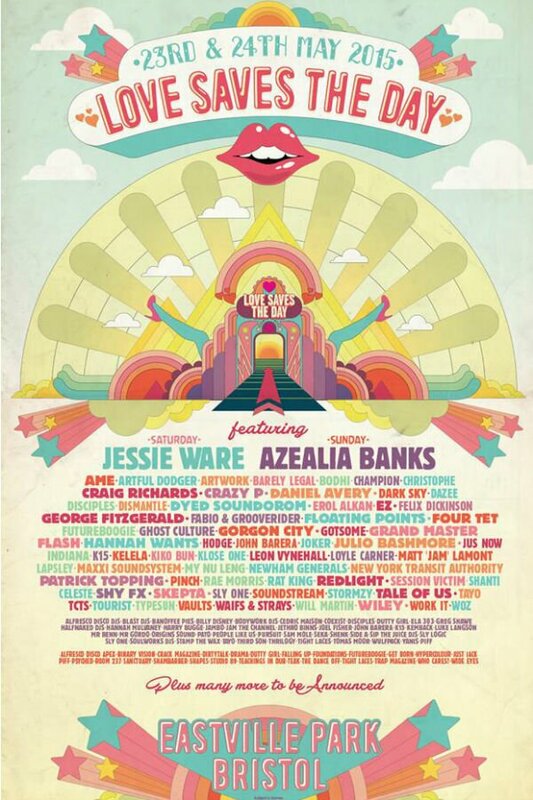 Soulful south Londoner Jessie Ware bags the headline slot on Saturday, while Azealia Banks will stake her claim to be Hip-Hop’s most prized asset ahead of the BET awards next month with her headline Sunday evening show. Other hard-hitting heavyweights include Groove Armada, Grandmaster Flash and local export Julio Bashmore, all of whom promise to deliver anthem-saturated crowd-pleasing sets. Elsewhere, Saturday’s bill reads like a Who’s Who in contemporary electronic music. George Fitzgerald, Kidnap Kid, Gordon City and Hannah Wants are likely to pull in the Air Max crowd, with Artwork and Jackmaster offering more eclectic spins on the omnipresent bass trend. Purists, however, may want to tune in to the likes of Leon Vynehall and Fabric resident Craig Richards for a more refined, minimalist sound. Standout performers Âme, meanwhile, are sure to dig deepest in the deep house stakes. Sunday welcomes a more diverse line up spanning genres and age groups: My Nu Leng and Joker continue to bass-heavy theme; mutant RnB progenitor Kelala promises dazzle with her slow-jams; 6Mix resident Erol Alkan offers anthemic acid beats; and Daniel Avery will take listeners on an expansive high-fidelity ride. Jungle jester David Rodigan, garage galvaniser DJ EZ and the inimitable Four Tet make up the ones-to-watch list over the weekend. Things also get rather grimey on the Sabbath. BBC Sound 2015 nominee Stormzy provides a youthful counterpoint to veteran revellers Artful Dodger, Wiley and Newham Generals. Meanwhile, man-of-the-moment Skepta will hope to energise a crowd a livelier than the one he performed to during a wonderfully incongruous Jools Holland appearance the other night. If these sounds sound like the thing you could get down to then pitch up at the Apocalypse stage for a few hours. But, as ever, you’re best off wondering round the stages soaking up new sounds in one of the most diverse, welcoming and creative cities in the country. We’ll see you there.